Thomas Grimsley, an Oxfordshire man, trained as a sculptor and terracotta maker in London. Married with a young family he moved to Oxford in the late 1830's and settled in St Giles', at first in St Mary Magdalen parish and later in St Giles' parish. He was a competent but not inspired sculptor, able to work in marble, stone or clay. He also understood the firing technology of converting clay casting into hard ceramic terracotta. In addition to creating quality church monuments and memorial tablets he had interests in fireproof construction, the supply of terracotta building materials, garden ornaments and grave markers. Working with his sons, Grimsley developed his business after 1850 as a major Oxford supplier of masonry memorial sculpture and grave markers. 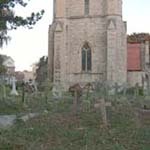 The opening of the three Church of England cemeteries at Jericho, Osney and Holywell in 1848 created a new demand for memorials which could be met from the Grimsley's yard in St Giles. Grimsley's sons Henry and Frederick continued the business into the 1890's after their father's death in 1875. 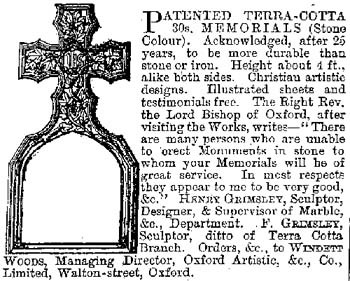 At the bottom of Grimsley's memorial price range were terracotta grave markers in a wide range of designs and made since the 1840's. These were sold to purchasers situated all over Southern middle England, from the River Severn to Kent, and between Birmingham and Southampton. 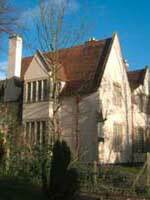 The majority were produced in the 1870's and were products of Henry and Frederick's workshop. Distinctively the terracotta markers can have an impressed potter's mark on the side near the base.�Generally reading GRIMSLEY OXFORD, the sons often added H + F in front or used the words GRIMSLEYS PATENT alone or with OXFORD below. Terracotta is a coarse heavy fired ceramic with a smooth external surface, generally a buff to pink colour. 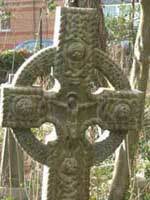 The grave markers are cast in moulds, sometimes made in two parts and bonded together. Dedication inscriptions are cut into the terracotta or placed on an applied stone tablet or more rarely painted. The appearance of the markers reflects the character and symbolism of the Christian tradition developed in the nineteenth Century Gothic Revival. The use of the IHS monogram for the name of Jesus and the representation of Jesus as the Good Shepherd are typical. 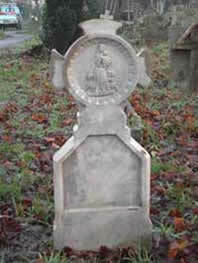 Three of these terracotta grave markers can be found in Ss Mary & John Churchyard. All have the impressed GRIMSLEY PATENT potter's mark. The marker (D19) erected in memory of Mary Shillingford who died in 1879 has an inscription of cut letters (her daughter's name being added in 1914). Being broken and damaged it was reconstructed and reset by the conservator Michael Eastham in 2006. A second marker (D192) records Annie Gordon, who died in 1886, where the dedication is added in black painted lettering. The third marker (D205) is blank, possibly having lost its painted lettering, as no trace can be seen of an applied tablet. 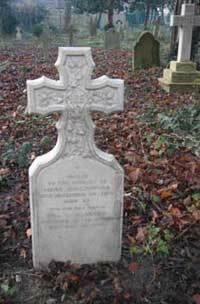 Mary Shillingford's marker records "HER END WAS PEACE" and Annie Gordon's dedication ends with a quotation from 2 Corinthians 4.17: "For our light affliction, which is but for a moment, worketh for us a far more exceeding and eternal weight of glory". 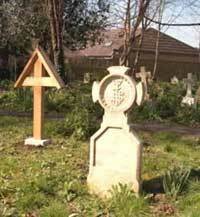 Grimsley Terracotta markers may also be found in Jericho and Holywell cemeteries and other Oxford churchyards. 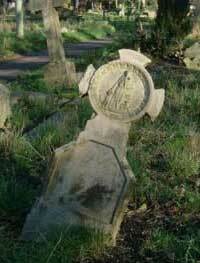 Ceramic grave markers are not common in England and the Grimsley series is the largest. The only comparable but smaller series is made up of grave markers made at the Compton Pottery in Surrey in the first half of the twentieth Century.